Are you looking to install a tankless water heater in Lindenhurst, Illinois? Need a trustworthy heater repair contractor in Lindenhurst? 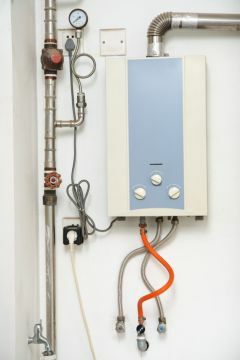 Tankless water heaters, also known as on-demand water heaters, provide only as much hot water as is needed. Rather than having water sit in a tank, continually being heated and placed on "standby", on-demand systems don't start heating the water until you turn on a hot water faucet, either at the sink, or through an appliance such as a washing machine or dish washer. Because of their increased efficiency, tankless heaters save consumers money. Unheated water runs through a pipe and into the heater unit when initiated. From there, the water is heated either via gas or electricity. Because the water is heated on demand, it is capable of delivering consistent, constant hot water. The biggest advantage of tankless water heaters is cost savings over time. On-demand units are much more energy efficient than conventional storage tank heaters. To increase heating efficiency even further, multiple heating systems can be installed, one for every hot water outlet. They can be used for bathroom additions, to boost other appliances or solar heating systems or for hot tubs and heated pools. Although the cost of purchasing and installing an on-demand unit instead of a conventional unit is a bit higher, the on-demand units tend to last longer, and cost less to operate through the years. They are also easier to repair. It is ID Mechanical Inc's experience that the advantages of installing a tankless water heater in Lindenhurst far outweigh the drawbacks. When you call ID Mechanical Inc to install a demand water heater, you'll be working with an industry expert who specializes in energy efficient heating and cooling systems. We are aware that for people in Lindenhurst, heating costs are important, as are concerns with how their behaviors impact the environment. ID Mechanical Inc heating experts take pride in knowing that we can offer many solutions that are more environmentally friendly than conventional heating and cooling methods. Once such solution is installing on demand heating systems. Almost 20% of the average monthly utility bills come from heating water. There are several things you can do to reduce the water usage of your Lindenhurst residence. Some with the most impact include fixing faucet leaks, installing fixtures with low flow features and using energy-efficient appliances. For more information and ideas on decreasing your total energy consumption, call ID Mechanical Inc at (847) 250-2737 today.